Getting Crafty with Jamie: Pirate Thank You! I wanted to send all the Amazing family w/ a hand stamped Thank You card... sadly that's 45 families and then there are the other PTA Members and Room Parents... soooo I snagged my My Digital Studio and created this fun and Pirate feeling Thank YOU! It's fun, easy and stylish... creating a great JPEG that I emailed to over 100 people in a matter of moments!! This utilizes our Nautical Expedition DSP and The Open Sea stamp set! I LOVE this elegant stamp set and how well this all comes together! 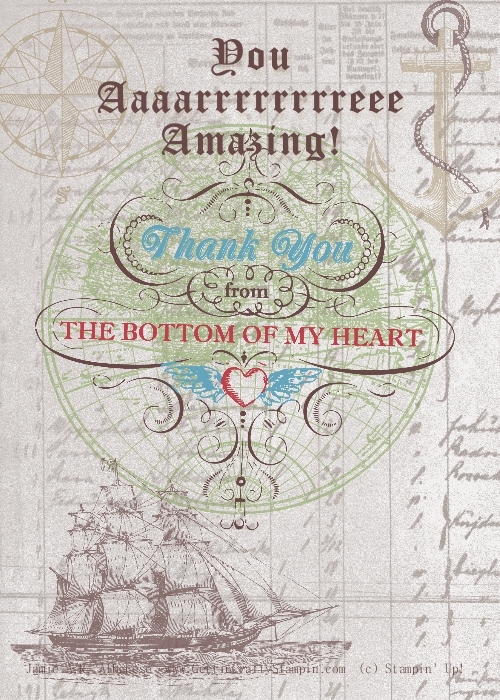 The Coloring tool helped in creating a fun element to the Thank YOU from the Bottom of My Heart sentiment from the From My Heart Stamp set! I know that Stampin' is a real part of my heart! I love that Digital Crafting like this is sooo quick, creating this card in a matter of minutes w/ techniques, papers and stamps... and then emailing them out... or if I'd wanted I could order them through Stampin' Up! for the printing or Costco or CVS... Easy Peasy, Lemon Squeezy! So, what do you think of this Fun card?? Comments are sooo appreciated and Thank YOU for Looking!! DID YOU KNOW Stampin' Up! is GIVING AWAY... Yes GIVING AWAY!!!!! Digital Downloads and Stamps all week long!! Too, tons are at 50% OFF!! A great way to craft, create and Thank People! I create great Picture Collages, Cook Books, Calendars, Gifts, Invitations and more w/ My Digital Studio and so could you!! On-Line digital lessons and Free classes at my home! Let's talk!! Want MORE info on My Digital Studio? Click HERE for more info! !